The most important decision you will make in 2019 is where to watch L.A. take on New England…lucky for you, we made the choice easy! 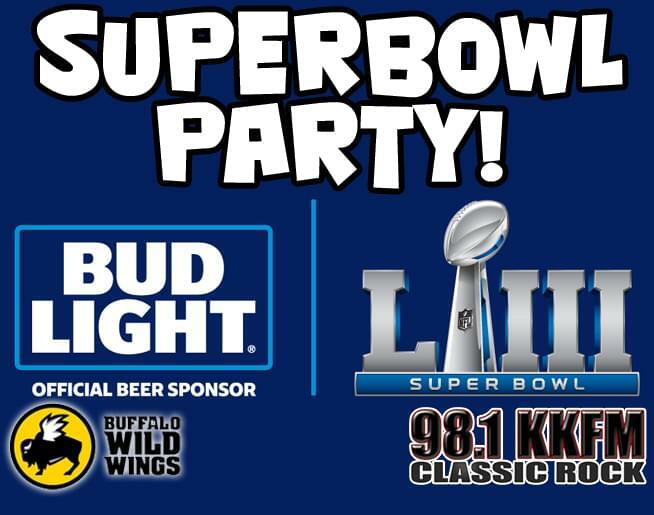 Join Ryan Kaufman from XTRA Sports 1300 and J.P. from 98.1 KKFM at Buffalo Wild Wings on North Academy for the Bud Light Super Bowl Party on Sunday, February 3rd! Be there from 3-5p to play trivia with Ryan and JP to win great prizes from Bud Light and Buffalo Wild Wings along with Adam Sandler tickets and Steve Martin and Martin Short tickets! Then when the game kicks off, get your square for a chance to win even more!